The gnomes of the old fairy tales have become sick of Fantasyland. Click here to play! Toadstools and forests are well and good, but all the trees become a bit much after a few centuries. Yes, yes, the beauty of nature is profound and all that, but can't a gnome at home become a Roamin' Gnome from time to time? See the world and visit exotic lands that lie far away from his home toadstool? In the Roamin' Gnome slots, you can earn some gnomish gold by escorting the little bearded fellows to exciting destinations around the planet. From the steppes of Russia, to the rainforests and surf of Australia. From the islands of Japan, to the culture of Paris. From the royalty of Great Britain to the heat of Mexico, the gnomes want to travel to all sorts of different places. Being gnomes, they need a human to organize flights, pack their suitcases, take the photos, and get them some passports. If you can make the arrangements, the Roamin' Gnomes can make it worth your while. You'll have to hurry to the Roamin' Gnome slots before it's too late, as the gnomes can only get away from Fantasyland for a short time every few centuries. If they miss out on a holiday because of a disorganized human, you could find yourself in big trouble with the little people. The Plane symbol is the scatter, paying out on the total bet when 2 or more land on the reels. It also triggers the Holiday Feature when 3 or more land on the reels. The Gnome symbol is wild, and it can substitute for any symbol other than the scatter. The first bonus is triggered by 3 or more scattered Plane symbols landing on the reels. 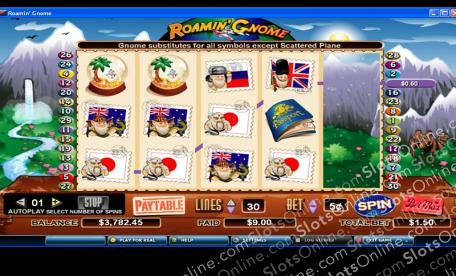 In the Holiday Feature, the player picks 3 travel destinations for the Roamin' Gnome and gets awarded free spins or prize money. During the free spins, winnings are doubled. The second feature is triggered when the Roamin' Gnome appears above a reel that shows the substitute symbol. In the Roamin, Gnome feature, all positions on the reel that the gnome stands over become substitutes, and then the wins are calculated from the new and improved paylines.